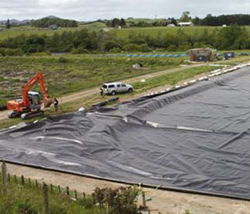 Fabricate and install a 2.00mm HDPE floating cover over an existing operational anaerobic balance pond at AFFCO New Zealand’s Horotiu site during the processing season. 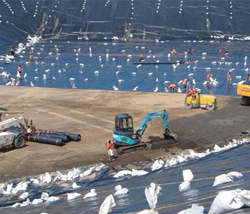 The pond was 140m long by 55m wide, resulting in a 9,000m² fabricated panel to be drawn down the length of the pond. The project also involved fitting five gas collection strings (drilled HDPE pipe fitted through HDPE drums) beneath the cover spanning the pond at equal intervals. 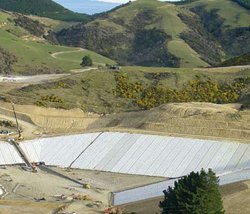 In the early 1990s there were 52 old landfills in Canterbury; none had the environmental protections found in modern, engineered landfills. The Councils understood that they needed to eliminate the unsafe old-style rubbish dumps throughout the region. 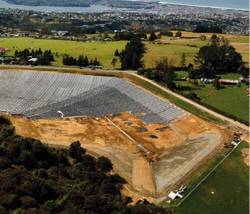 The Dunedin City Council required a raw water storage facility adjacent to the Mount Grand water plant. The storage was required to improve security of supply in the event of extended maintenance being required on the 58km long supply pipeline. The storage would also provide improved operational flexibility at times of high turbidity in the supply. For many years Wanganui pumped its wastewater into the Wanganui River, then in later years implemented an ocean outfall system. In the early 1990s a working party was formed to find a better solution to deal with untreated wastewater rather than pumping it out to sea. The solution was to build two lagoons for wastewater treatment.